In 1637 John Warner was appointed Bishop of Rochester. As a mark of gratitude, he ordered a magnificent new font for Canterbury Cathedral, to replace the plain brass basin then in use. Bishop Warner awarded the commission to the sculptor and mason John Christmas, one of a family of sculptors with a record of prestigious architectural commissions. The font was completed in 1639 and was celebrated as an 'excellent and exquisite' addition to the Cathedral. However, the expensive marble and the statues of Christ and the four Evangelists made the font a target of Puritan disgust and it was badly damaged during the Civil War. This highly finished perspective drawing must have been drawn by John Christmas or by a professional draughtsman working for him. Bishop Warner's signature appears on the drawing, suggesting that he presented it to the Cathedral upon the commencement of work on the font. The drawing was rediscovered at an antiques market in 2002. It is now the earliest English design for sculpture in the V&A's collection and one of the finest anywhere, in terms of scale, finish and execution. It provides invaluable evidence about the architectural history of Canterbury Cathedral, where the font remains to this day. Drawing in pen and watercolour on vellum showing a church font. The font and steps are shown as black and red marble and the cover as carved wood. The font and cover are decorated with sculpted figures. There is a scale and a faint signature at the bottom of the sheet. Though presumably presented to the dean and chapter at Canterbury it apparently remained amongst Bishop Warner's papers; it was probably in his possession in 1663 when he entered into the agreement to with Phillips and Jempson to rebuild the font. According to the Bishop himself, many of his papers were seized when his 'Spiritualities and Temporalities' were sequestered between 1646-49. In his will (1666) Warner left "all my printed bookes and written paper such as doe in any way concern my Estate' to his nephew, Doctor John Lee, Archdeacon of Rochester. The whereabouts of the drawing were unknown until it was found on a barrow in the Portobello Road, London, in February 2002, by Tim Knox and Todd Longstaffe-Gowan. It was sold by them to Christopher Gibbs. Historical significance: The designer: John Christmas (1599-1654) and his less well recorded brother, Matthias (1605-1654) came from an English family of sculptors, wood-carvers and artificers. They inherited the position of their father, Gerard [Garret] Christmas, as Master Carvers to the Navy, but also carried out decorations for royal and civic entertainments. They worked together on the decoration of the warship The Sovereign of the Seas (launched 1638), as well as many tombs, some dependent on allegorical figure sculpture. John Christmas sometimes worked independently of his brother - for example on the Great Gateway of Magdalene College, Oxford (completed 1635). His name only is cited in the contract for the Canterbury font in 1637. Subject and origin: this drawing is, according to John Harris, Curator Emeritus, RIBA Drawings Collection 'the most important English Renaissance architectural drawing to have been discovered in recent years'. The Canterbury font was commissioned by John Warner, Dean of Lichfield, on the eve of his promotion to the Bishopric of Rochester, from the sculptor and mason, John Christmas. It was completed in 1639 and still survives, though extensively rebuilt in 1663 by John Phillips and Thomas Jempson following damage during the Commonwealth. Until the discovery of this drawing, the design of the font was unattributed. 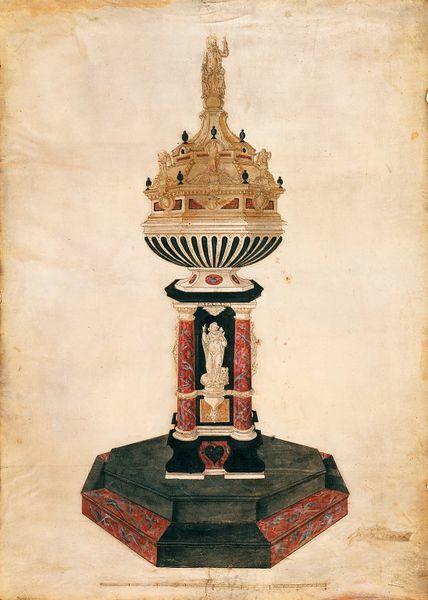 The drawing now provides a basis for comparison between the design and the surviving specification naming John Christmas (1663), the surviving font, and signed and attributed works by John Christmas and his brother Matthias. This drawing has several features which are characteristic of their work - the most significant being the 'wayward Doric' architectural order of the columns, where each capital has a broad abacus and echinus composed of egg and dart moulding with a course of small beading immediately below. Such columns can be found on the monuments of Archbishop Abbot at Holy Trinity, Guildford, Surrey (1635; signed by John and Matthias Christmas), of Mrs Temperance Browne at Steane Park chapel, Northamptonshire (1635), and of Sir Thomas Hamon at Upper Hardres, Kent (1634). Abbot's monument shares the greatest number of attributes with the Canterbury font. The Patron: John Warner (1581-1666) took holy orders at Oxford. His first ecclesiastical preferment came in 1614 when he was appointed Rector of St Michael's, Crooked Lane, London. Further appointments to parishes in Kent and London followed in 1619, 1624, and 1625. He was made Dean of Lichfield in 1632, and appointed as Chaplain to Charles I in 1633, and attended the King at his coronation the same year. In 1637 he was promoted to the Bishopric of Rochester. Warner was an ally of Archbishop Laud, supporting his reforms, and his interest in rich church furnishings and decoration. He was a benefactor to Laud's campaign to restore St Paul's Cathedral in 1631, and he continued to indulge his enthusiasms for 'the adorning of God's house' elsewhere. Setting up fixed altars, fonts and other furnishings were common practices in churches at this time. History of the font: in 1637 Canterbury did not possess a fixed font but merely a brass basin on an iron support. Noting 'the want of a fixed Font in the Cathedrall church of Canterbury', John Warner set about having one built 'at his own charge'. This costly gift was no doubt intended to express his gratitude to the King and to his Archbishop for his recent promotion. He recorded in his will of 1666 that during his life he gave 'for the making and remaking of a font in ye Cathedrall church of Christ in Canterbury five hundred pounds'. William Somner, the Anglo-Saxon scholar, antiquarian, and loyalist friend of Warner, considered the font to be an 'excellent and exquisite' embellishment to the cathedral. He described it at length in his The Antiquities of Canterbury (1640). A large fold-out engraving of the font - which closely follows the drawing, and must have been based on it, rather than on the font itself, as built - was included in the first edition. It is inscribed 'This Font was given by the right reverend father in God, John L:rd Bishop of Rochester, consecrated by the right reverend father in God, John L:rd Bishop of Oxford this present year, 1639.' This text is almost certainly a transcription of the dedication on the font. The layout of the dedicatory text on this 1640 engraving closely resembles the format of the Christmas brothers' signature that figures prominently on the ledger of Archbishop Abbot's monument. The original font was in place for only two years before it was vandalised and later completely dismantled. Warner was impeached by the House of Commons, and imprisoned in 1641, for defending the existing constitution of church and state. When he was reinstated in 1663, the rebuilding of the font was one of his highest priorities. The Heritage significance of the drawing: design drawings (whether contract or presentation drawings) from this period are very rare: there are only six surviving English examples of contract drawings which can be connected with existing monuments: these include a contract design for a monument by John Christmas (Leeds Archive; formerly Newby Hall, Yorkshire); two copies after Maximilian Colt, for the sculptor's designs for the monuments to Sir Edward Carre, and Frances, Lady Grantham, both 1619 (College of Arms); two designs attributed to Cornelius Cure, one for an unexecuted monument to King Edward VI, and a design for the effigies of a man and woman (both Bodleian Library, Oxford). None of these drawings can compare to the scale, finish and standard of execution demonstrated in the Canterbury font design. 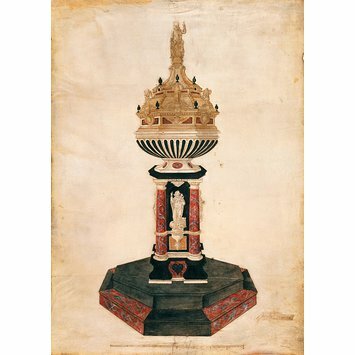 Presentation drawings are even rarer; they include those for the tombs of Queen Elizabeth and Sir Christopher Hatton (Bibliothèque Nationale, Paris), and a design for a fountain at Hampton Court by Cornelius Cure (Hatfield House). The drawing is a key document in the history of a major feature of the interior fabric of Canterbury Cathedral (a UNESCO-designated World Heritage site), and shows the font in its original form. The font itself is considered to be one of the most important examples of Renaissance church furnishing to survive in England. As such it is the product of the brief flowering of international Court Culture in England during the reign of Charles I, a culture overwhelmed and destroyed by the Civil War of 1642-9. The commission of this font was an important one for the period, and the whole history of the commission and the building and subsequent rebuilding of the font are well-documented; this design adds a vivid and vital element to the historical record. The exact purpose of the drawing has been the subject of debate. It has been argued (by Todd Longstaffe-Gowan and Tim Knox in an unpublished paper) that the drawing is a contract drawing but research by other authorities (notably Adam White) suggests that it is in fact a presentation drawing. The arguments against it being a contract drawing are firstly, that it is unusually elaborate and splendid. The few contract drawings known to survive from this period are mostly slight and sketchy: even the more finished examples (e.g. Maximilian Colt's drawings for the Savile monuments at Thornhill and Methley) which are quite detailed, do not compare with this. Secondly, the drawing is not signed by the sculptor though a signature would usually have been required as proof of commitment to the undertaking. Thirdly, the 1637 contract particulars, as reported in the 1663 contract (for the rebuilding of the font) do not correspond to the drawing in two important respects: the structure is supported on three steps, not two, and there are no statues of the 12 apostles on the cover. The drawing is on vellum - not paper, which would have been more usual for a contract drawing. It depicts the font in perspective. Below the image is a scale. The drawing is signed by the font's donor, John Warner. All this suggests that the drawing was made for presentation, presumably to the Dean and Chapter of Canterbury, to impress them with his proposed munificence. The size of the drawing, and its meticulous execution confirm that it was a commission of great importance. This drawing may be by John Christmas, but could have been carried out by another hand, as presentation drawings were often made by professional draughtsmen, worked up from the sketches supplied by the sculptor. William Somner, The Antiquities of Canterbury , (1640), part 1, pp.181-2. In 1637 John Warner was appointed Bishop of Rochester. As a mark of gratitude, he ordered a magnificent new font for Canterbury Cathedral, to replace the plain brass basin then in use. Bishop Warner awarded the commission to the sculptor and mason John Christmas, one of a family of sculptors with a record of prestigious architectural commissions. Completed in 1639, the font was celebrated as an 'excellent and exquisite' addition to the Cathedral. During the Civil War, however, it was badly damaged when its expensive marble and the statues of Christ and the four Evangelists attracted the wrath of the Puritans. This highly finished perspective drawing must be the work of John Christmas or a professional draughtsman working for him. Bishop Warner's signature appears on the drawing, suggesting that he presented it to the Cathedral when work began on the font. The drawing was rediscovered at an antiques market in 2002. It is now the earliest English design for sculpture in the V&A's collection and one of the finest anywhere, in terms of scale, finish and execution. It also provides invaluable evidence about the architectural history of Canterbury Cathedral, where the font remains to this day (see photograph).